Large wholesale self-inking address stamp. These pre-inked wholesale stamps last up to a whopping 25,000 impressions. Stamps are refillable and come in two sizes. Our large trade self inking stamp helps eliminate repetitive tasks. 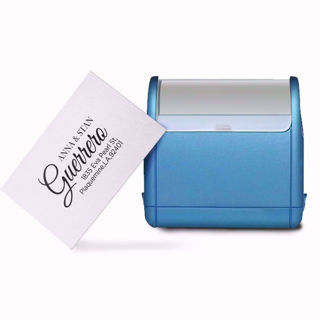 Simply a must for business people, hobbyists & collectors, you can save time at the office because your own customized rubber signature stamp replaces the tedious process of signatures and authorizations. These pre-inked trade stamps last up to a whopping 25,000 impressions and feature our award-winning ink transference technology. Our wholesale pre-inked in black ink stamps are refillable and come in two sizes. Available in small (0.53'x1.9375') or large (0.75'x2.375').